Kuta, in southern Bali, has become the island's most popular and most crowded holiday resort, blessed as it is with a lovely sweep of golden sand, crashing surf and spectacular sunsets. The natural attractions have now been complemented by the tourist trappings, and Kuta is bursting with hotels, shops, restaurants and an energetic nightlife. 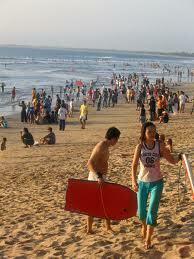 Kuta is Bali’s most popular tourist destination. Located in the south of the island, Kuta is a mecca for tourists looking for cheap accommodation and vibrant nightlife. Close to the airport at Denpasar, Kuta boasts a beautiful sweeping beach fringed with coconut palms, however its popularity means that the resort is very developed with a huge number of hotels, bars, restaurants and shops. As Kuta is close to Denpasar’s main airport, there are no direct flights to Kuta, Indonesia as the resort is only a short transfer away. Many of the world’s most popular airlines fly to the island of Bali including Qantas, Thai Airways and KLM. Air Asia X is a popular low cost airline if you’re looking for low cost flights to Kuta (Bali). The sands of Kuta beach are packed with visitors, touts and local vendors selling a whole host of wares including sarongs, crafts and imitation watches. 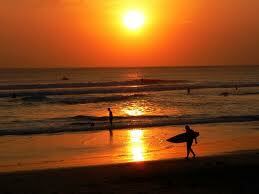 Kuta is also famous for its great surfing and is one of the best places to surf in Indonesia. It attracts surfers from all over the world and is a superb place to learn to surf with a choice of surf schools offering lessons and a huge selection of surf shops selling all the latest gear and equipment. Kuta’s legendary nightlife and party scene is one of its main draws and the narrow streets and beachfront are jam packed with bars, pubs, clubs and venues offering live entertainment. There is a great choice of accommodation to be found from budget rooms and apartments to luxury 5-star hotels. Head to Legian Street for Balinese crafts and souvenirs and the nearby Temple of Tanah Lot, one of Bali’s most holy temples with a superb island setting. For the cheapest flights to Kuta, Indonesia, we advise that you try and book in advance and avoid the peak times of year to travel such as the school holidays or over the Christmas and New Year period. Try our great flight comparison search and take your pick from the selection of cheap flights to Kuta, Indonesia with unbeatable fares through our travel partners. As well as the most competitive fares around, we can also find you the best deals on lastminute flights to Kuta, Indonesia.